We put the Wilson AVP and the Spalding King of the Beach volleyballs through a gauntlet of tests. Although both beach volleyballs performed great, the Wilson Official AVP Outdoor Volleyball is our choice as the best beach volleyball. Beach volleyball is a growing sport that not only allows you to be active with friends, but to work on that tan at the same time! Choosing the right beach volleyball to play with can make a drastic difference in this sport. 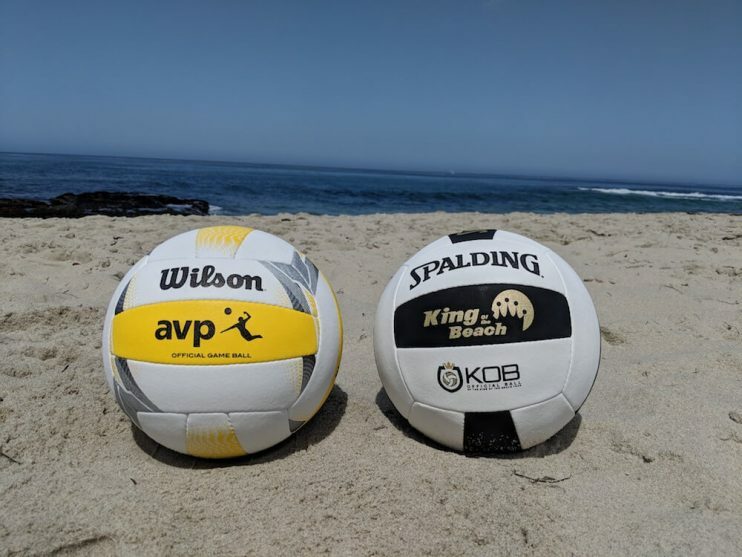 With summer in full swing, we decided to test two of the most popular beach volleyballs on the market – Wilson AVP and Spalding King of the Beach. There are quite a few differences between an indoor volleyball and a beach volleyball. First, indoor volleyballs tend to be smaller, heavier, and have less overall cushion than beach volleyballs. Additionally, indoor volleyballs are not designed to withstand outdoor weather elements. Beach volleyballs tend to be slightly bigger and have more cushion than indoor volleyballs. They also have interior bladders designed to withstand extreme heat and exterior surfaces that can get wet and sandy (although this is still not recommended). This is why it is so important to use a volleyball designed for outdoor use when playing beach volleyball. Beware of replica volleyballs for either of these brands. These replica volleyballs are not the same as the official volleyballs and are made with significantly worse materials and quality standards. We chose the Wilson AVP and the Spalding King of the Beach for several reasons. Both beach volleyballs are very popular amongst serious beach volleyball athletes, and both have outstanding user reviews. We have also used a variety of beach volleyballs when playing over the years, and have found these two volleyballs to be at the top of our list. This volleyball has a cult following. It is by far the most widely used ball amongst beach volleyball players and is the official ball of the Association of Volleyball Players. 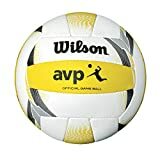 Most top-level professional beach volleyball tournaments are AVP sponsored, so this ball is used quite often among the pros. There are even a number of beach volleyball enthusiasts who refuse to consider any other beach volleyball. This volleyball definitely ranks as #1 in popularity and is no doubt a great ball, but we felt it was time to compare it to a ball that has recently gained a lot of support. Both the Wilson AVP and the Spalding King of the Beach are similarly priced in the low to mid $40 range. Once again, you will see replica volleyballs priced significantly less, but replicas are nowhere near the same as the official volleyballs themselves. Both volleyballs shipped fully inflated. Immediately the overall fit, finish, and quality of both volleyballs stood out. The material of this volleyball feels very soft and has a outer layer of “squishy-ness” that provides great cushioning for your low forearms. The material is a microfiber composite that feels high quality, however it doesn’t resemble an actual leather feel. The seams are hand sewn and are so flat that you can barely feel them. 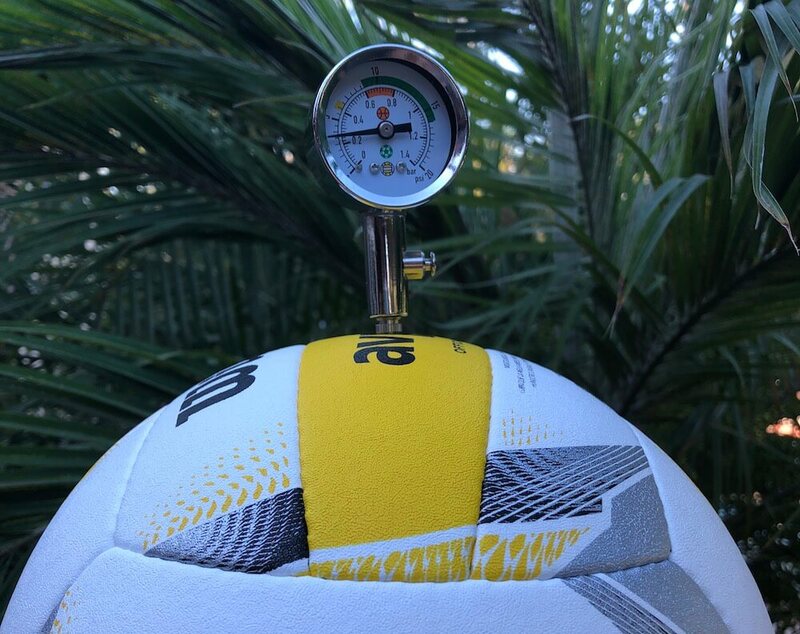 The needle hole for filling the ball with air doesn’t protrude at all, and is basically invisible unless you are looking for it. This volleyball is fairly lightweight when compared to the King of the Beach. Overall, the Wilson AVP feels game ready and makes it hard to believe that there is another volleyball out there that can feel much better. The material of the King of the Beach differs from the AVP in that it is more firm and feels like genuine leather that is very easy to grip. The seams are also hand-sewn, however they are not as flat as the AVP’s seams and are very noticeable as you can feel the hard edges where the seams are sewn together. The needle hole has a plastic surrounding that protrudes from the surface, which makes you wonder why they couldn’t have created a needle hole similar to the AVP’s (if it weren’t for the needle hole, the Spalding King of the Beach may have beaten the AVP in the “First Impressions”). This volleyball is slightly heavier than the AVP. 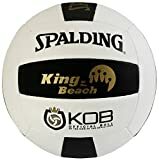 Overall the Spalding King of the Beach is a quality volleyball with lots of grip and a durable feeling surface. To determine which volleyball is truly better, we decided to put the Wilson AVP and the Spalding King of the Beach through a series of tests to compare their attributes in terms of moisture wicking, air pressure retention, and grip/control. In beach volleyball, there is always the potential for moisture to get on the volleyball, whether it be from sweat, rain, or the volleyball accidentally rolling into the water. When this happens, it is essential for the volleyball to do several things well. It must wick the moisture away quickly, be able to dry fast, and also still have grip when wet. To test how quickly these two volleyballs are able to wick away moisture, we placed each ball on a rack over a pan, and then poured 4 ounces of water over the ball. We then measured how much water was left in the pan, which would effectively tell us how much of the water was wicked away by the ball versus how much water remained on the ball. We did three pours on each ball and then took the averages. As you can see, the Wilson AVP AVP proved to wick away the water better than the Spalding King of the Beach. Additionally, due to the Spalding King of the Beach’s hard edged seams, the water seemed to pool on the ball instead of stream off of it. This also could be due to the King of the Beach’s more genuine leather feeling surface. If you know it is going to rain, or if you sweat profusely, the Wilson AVP may be the better volleyball to use in that situation. As you can see, the Wilson AVP initially lost air pressure pretty quickly, however once it reached its 3.2psi maximum, it didn’t lose any additional pressure. The Spalding King of the Beach on the other hand lost pressure consistently over the seven days. This was disappointing as it has a recommended maximum of 4.5psi, which led us to believe the test would be favorable for the Spalding volleyball. Our results lead us to believe that as long as the Wilson AVP is filled within its recommended pressure parameters, it will retain the air pressure better than the Spalding King of the Beach. Perhaps the most important aspect of a beach volleyball is its grip and control. A beach volleyball must have good grip, as it will make hitting and open handed setting much easier. A beach volleyball must also have good control – meaning that the volleyball bounces off of your forearms predictably when passing or bump setting and is easy to open-hand set. With wind not playing a factor, the Wilson AVP is the easier ball to control while passing and hitting. It feels great to both pass and bump set, although a traditional open-handed set is not as easy with the Spalding King of the Beach. When wind is introduced as a factor, this ball tends to move quite a bit and gets tricky to control. This is most likely due to its light weight. Overall, the Wilson AVP is the perfect ball to use in perfect conditions, but let’s be real, rarely are there perfect conditions at the beach. Since this ball is heavier, it is definitely not as affected by the wind as the Wilson AVP. It is much easier to bump set, open-hand set, and pass in windy conditions. With no wind, it is easier to open-hand set than the Wilson AVP, but is not as easy to control with passing and bump setting. If moisture on the ball becomes an issue, this volleyball becomes a little more slippery than the Wilson. Based on all of our testing, we have to give the nod to the Wilson AVP as the best beach volleyball. This however, is a hard endorsement as each volleyball is better in different conditions. 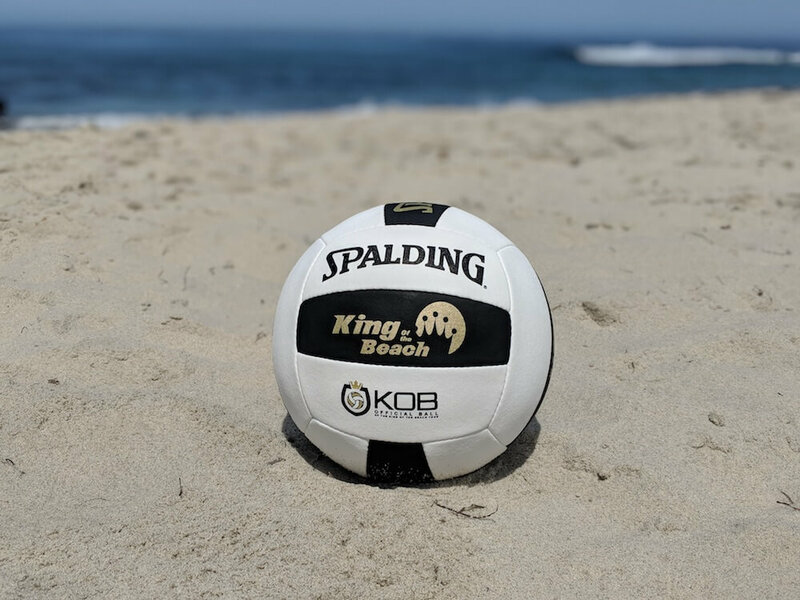 If it is within your budget, we highly recommend buying both volleyballs so that you can use the Wilson AVP in less harsh conditions and the Spalding King of the Beach in more windy conditions. Overall, you can’t go wrong with purchasing either of these volleyballs. It just so happens that because the Wilson AVP is clearly better at retaining air pressure and wicking away moisture, that it is our choice for the best beach volleyball. Keep the ball inside when it is not being used. Wipe away any sand and moisture after use. Write your name on the ball and put a unique decoration on it. Beach volleyballs are notorious for getting stolen. If you just put your name on it, that can easily be crossed out or turned into a design by a thief. We recommend putting a unique design on your ball that can not be easily covered up so that your volleyball would be clearly distinguishable even if stolen. Sit on the volleyball – it will warp. Get the volleyball wet or play with it in water. Keep in your car’s trunk or your garage if you live in a hot climate. Leave your volleyball unattended at the beach. Bounce the ball on any hard surfaces. Whether you choose the Wilson AVP or the Spalding King of the Beach, you will be getting a high quality beach volleyball that will not disappoint. 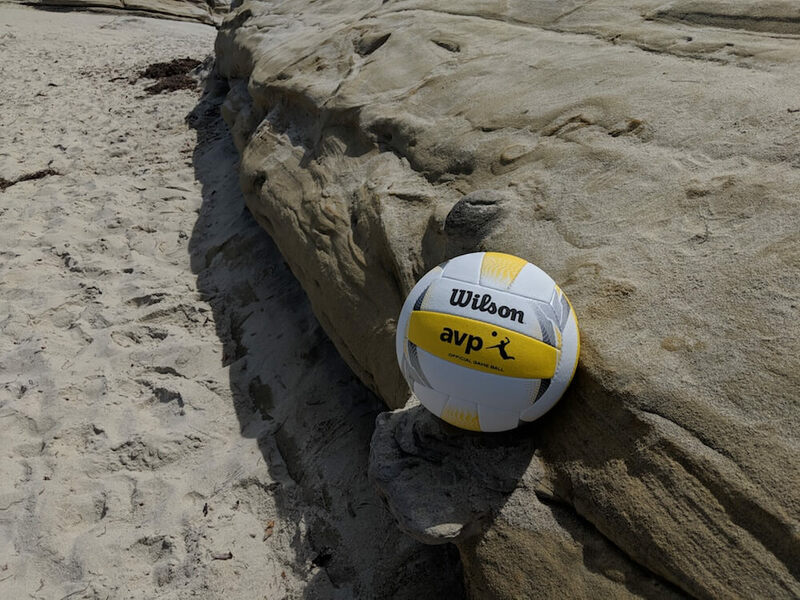 The Wilson AVP is our choice, now make yours and get out there and play! To make sure you don’t forget any items on your next beach trip, like your Wilson AVP volleyball, check out our beach packing checklist.